The following Syllabus elements and Assessments/Assignments were used during the Spring 2017 semester. They formed the "activities" for Prof. Bennett's research and data collection. To Students: Please do not refer to these pages for current assessment information. You'll want the Syllabus, Assessments, and Classes pages (in the header) instead. There are four graded assessments in this course. Blogging Project (350 points total): Points are earned here through creating blog posts, providing comments to peers, giving feedback to group-mates, and being an excellent team member. This is the most complex and time consuming project in the semester. The 330 points includes both group (225 pts) and individually (125 pts) graded components. Read/Tweet Primary Sources (36 points total): Points are earned by tweeting on time about the reading for class. You'll read a primary source (something written in the time/place we're studying) and then tweet out questions, comments, and responses the evening before class. Each student will complete nine of these assignments, worth 4 points each. Discussion Reflections (50 points total): Points are earned here through thoughtful, expansive reflection on the primary sources read for class. You'll complete two 500-word reflections about our discussions in class. Each essay is worth 25 points. The goal will be to answer the question, "Why is this source worth studying?" Read on for more detailed descriptions of the assessments + rubrics for grading in each category! Build content knowledge, social & academic community, and practical skills through presence in class and conversation with other students in person and via Twitter. Attendance and participation are graded together because the two reinforce each other. BUT! You may miss two regular classes. No penalties. No MCs needed. Because stuff happens. At the end of the semester, those two missed classes will be dropped. Missing more than two classes may impact your grade. Arriving late to class on a regular basis will also affect your grade. At the beginning of the semester, you will complete a "#participlan" - a short Twitter essay about how you will challenge yourself to participate this semester. From me, you will receive mid-semester feedback regarding your participation and an end-of-semester grade. There are multiple paths to earning 125 pts for Attendance & Participation. You don't have to do everything; you just have to do some things really well. Think of it like a game where points are earned until a goal (125 points) is met. You may not score more than 125 points for Attendance & Participation. The following rubric will be used to grade participation & attendance. You can download a PDF copy here or view as a spreadsheet in the HWC Shared folder on Google Drive. For each class you will read one or two primary sources. (That is, a document created in the time period we're studying.) 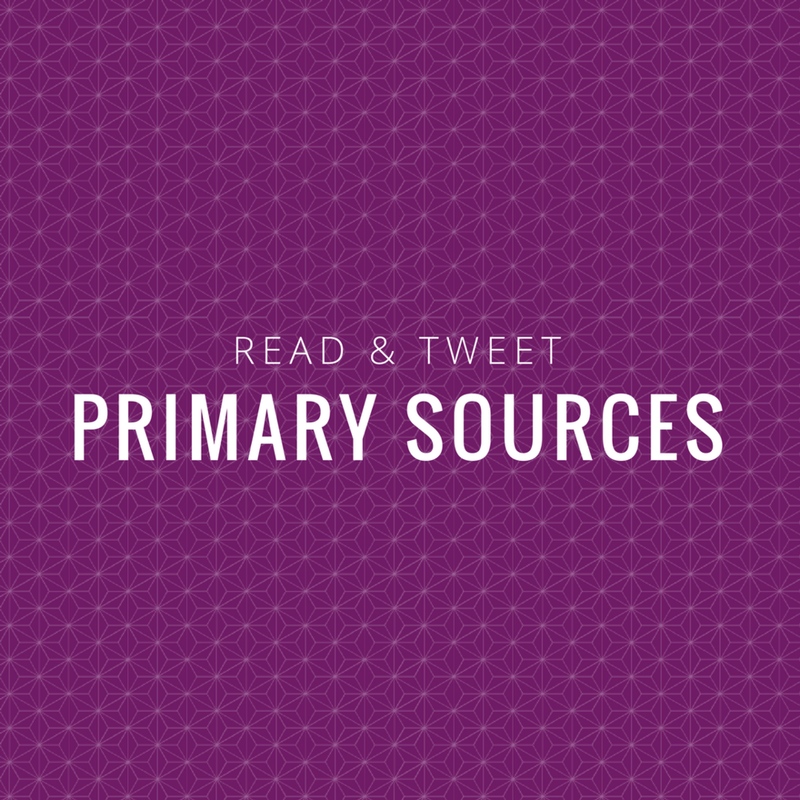 Once a week, you will also tweet two questions or comments related to the primary source reading(s) for class. Purpose of Assessment: Familiarize students with historical texts related to course content. Help students grow ability to use primary documents as evidence of what a time or place was like. Facilitate in-class discussion through pre-class preparation. Skills: Reading for content, context, and author's perspective. Collaborative reading with peers. Creating concise commentary through tweets. Increased digital fluency. For each class, you will be asked to read one or two primary sources. The primary sources assigned for each class can be found on the individual class pages. Most primary sources contains small yellow bubbles that annotate the text and attempt to clarify some unfamiliar words or ideas. I recommend reading them for added context. Our discussions in each class depend on your familiarity with the primary sources, so do keep up with the reading. It's also helpful (to you, your peers, and your prof) to arrive in class with some notes or questions about the readings. When it is your group's turn to tweet, you should plan to provide at least TWO tweets that contain a question or comment about the source. Ask a "why" question - why does the author think this? why does a character take this action? why is this word or concept important? Share a key quote that you think is interesting, fun, insightful, or confusing. Say "I don't understand..." a portion of the text, a quote, a character's actions, etc. Use the Retweet option to Quote a classmate's tweet and add an additional idea, quote, or question. Connect or compare the text to others we've read in class. Share a link to a resource - a video, summary, article, or other webpage that helps illuminate the text. The focus for your responses should be quality rather than quantity. Do your best to add tweets that are honest, thoughtful, and further the discussion. Be willing to risk saying, “I don’t understand.” Share things that are genuinely interesting to you. Comment on things you believe are important to history. At least one tweet must be original (meaning, it is all your own content or ideas). To be assigned during Class 3. Tweets are graded for completion, not correctness. Each student will complete 9 rounds of primary source tweets. Students who submit 8/9 rounds of tweets on time will receive a bonus of 4 points at the end of the semester. Group discussions of the primary sources in class are a collective, collaborative effort to make sense of and gain insights from the primary sources. The rapid pace of a class meeting doesn't leave a lot of time for personal reflection, however. That's where this assessment comes in. The discussion reflections are NOT a summary of the class or a comprehensive analysis of the source discussed. Instead, these short papers are intended to be thoughtful, deeper dives into themes of interest in the primary sources and in discussions of those sources. This assignment, ideally, will be driven by personal interests in the subject matter. Purpose of Assessment: To test student knowledge of the content and importance of the primary sources. To encourage personal connections to historical material. Skills: Writing. Evidence-based critical thinking. Active listening. Choose 2 classes this semester to write about. You may choose to write both of the reflections about discussions between classes 4 and 14. It is up to you to decide which two discussions you wish to reflect on. Submit by sharing - no need to email. Why is this source worth studying? The question should be answered by referencing the primary source(s) discussed in class. Include specific examples and quotes from the text or detailed descriptions of the image or artifact. What does the source tell us about the time and place we studied in class? How does it connect to lecture or Crash Course material? How does this source compare to others we've read/viewed in the course? Does it address a common theme in the course? Or is it something new? Is the source valuable to you in a personal way? Are there passages that connect with your experience and worldview? Does the source challenge your worldview or push you to see things differently? Please consult the class calendar. Deadlines are typically about 3 days after a discussion, with a few exceptions to avoid conflicts with other assignments due. Grading will follow the rubric linked HERE. (Downloadable PDF file.) The file can also be found in the HWC Shared folder on Google Drive. Grow research and writing skills. Deepen knowledge of content and interpretation of history. Create public writing students can point to after the class. Foster teamwork. Increase comfort with new technology and social media. This semester you will write two blog posts. For each blog post you will create a draft, receive comments from your prof and peers, and submit a revised final copy of the post. I'm providing a (very) quick start guide here. You will need to read the "required further reading links" below for full details. Blog Post 1 is text-based; it's sort of a traditional research project, sort of a Wikipedia page, sort of a blog post. 1000-1500 words max. Worth 75 pts. Blog Post 2 is a creative post that should narrate history through the use of rich images, video, social media, or creative writing. Length/scope is negotiable. We'll work it out together depending on the project. Worth 75 pts. There is a full list of resources available under the Blogging Project Resources link (in the footer) - including how to create a blog post, how to pull flash images from a museum website, and how to create the yellow bubble footnotes. I encourage you to get to know your group mates and work out a plan for division of labor early on. Ask each other some getting-to-know-you questions, check in about your work styles, take the 16 personalities quiz together... Whatever helps you bond as a team is great. You may choose your topics from a list of potential topics provided [list will be available by Thursday]. Both topics must be from the same civilization. Only one group may cover any given topic. These guidelines are also new to this semester. With the list of topics, I'm hoping to direct you toward important and interesting things you might not stumble on by accident. By asking you to choose two topics from the same civ, I'm hoping you'll come away with a deeper understanding of how complex societies are. That's the goal anyway. We'll see how it works and may loosen up the rules for Post 2. Topic consultations are part of this project. During class 2, each group will have time to sign up to meet with me on Feb 9 or 10 to discuss your topics and first steps. Each student will provide at least 3 comments (worth 30 points total) on Post 1 drafts and 3 comments (worth 30 points total) on Post 2 drafts. Choose posts of interest to you and/or posts for which you feel you can offer constructive criticism. To best assist your peers and receive full points for this portion of the assessment, comments should address both a positive element and something that could use improvement. Does the post have a clear statement of purpose or a thesis statement? Do I understand the main point of the post? Is the topic's importance to history present and clear? Are there clear, specific examples to support the significance and thesis? Do transitions from one section to the next make sense? Is the post easy to follow? Is the writing or presentation engaging? If not, how could it be made more engaging or fun to read? Are images Creative Commons/Public Domain and cited properly? Are there hyperlinks to sources? Is there a references list? If so, do the sources look scholarly/educational? What did you personally contribute to your group? How satisfied are you with your group members' work? You'll complete three individual feedback forms, worth 5 points each. Your feedback helps me (your prof) identify and assist with content, technical, or group issues as they arise. This is an individual grade based on my (Prof. Bennett's) observation + your peers' assessment of team dynamics and individual effort. Contributing equally to the workload through brainstorming, research, writing, and work on the class blog. Submitting your materials to group members in a timely manner. Attending group meetings and making group deadlines. Consistently staying in contact with group members. Addressing group dynamic issues in a respectful way and working to resolve issues in the group. Requesting assistance from Prof. Bennett for content, technical, or group dynamic issues. If your peers and Prof. Bennett are satisfied - or, better yet, thrilled! - with your work in the group, you will receive full or close-to-full points. Thank you! Your subscription preferences have been recorded. This work is licensed under a Creative Commons License that allows for and encourages the use, adaptation, and sharing of HWC authors' work for non-commercial purposes. You can read a fuller explanation of what this means here. Footnotes run on Bigfoot.js by Chris Sauvé. Powered by Squarespace.